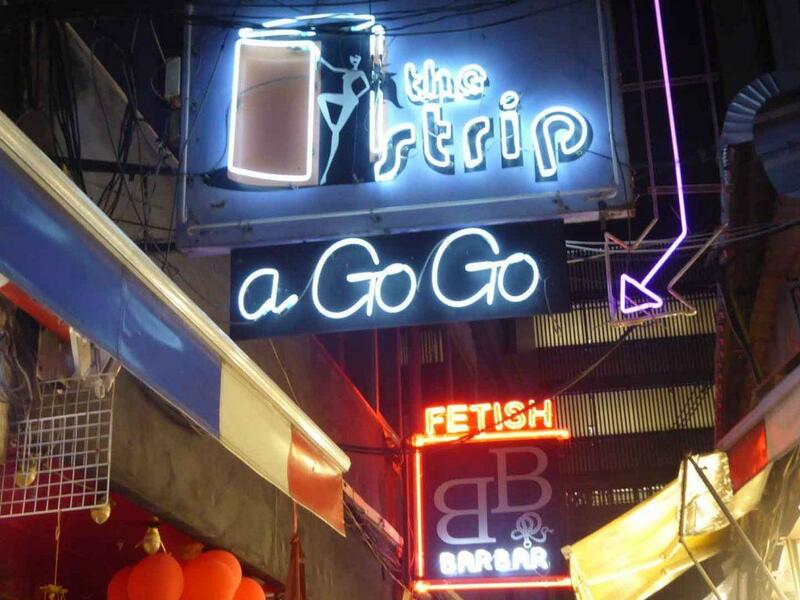 Bangkok’s Go Go bars can be found on Patpong Soi’s 1 & 2 on Silom Road, and at Nana Entertainment Plaza and Soi Cowboy on Sukhumvit Road. The Gay equivalents can be found on Soi Twilight on Surawong Road. 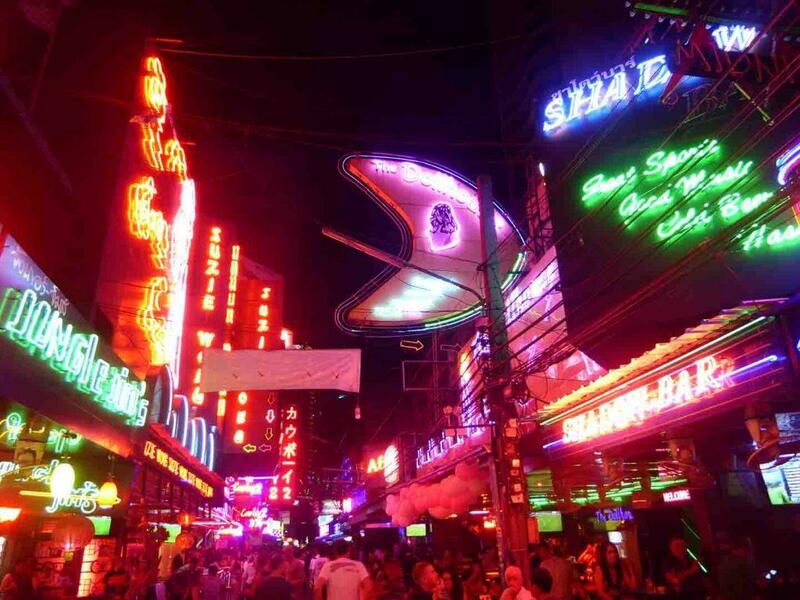 Patpong is a world-famous red light district located in the nightlife district of Silom. It has featured in several movies over the years and is a major attraction for both tourists and expats. It’s a completely safe area to explore with the only hassles coming from touts trying to direct you to ping-pong shows and certain bars. There are two streets, Patpong Soi’s 1 & 2. The two parallel streets run between Silom and Surawong roads. 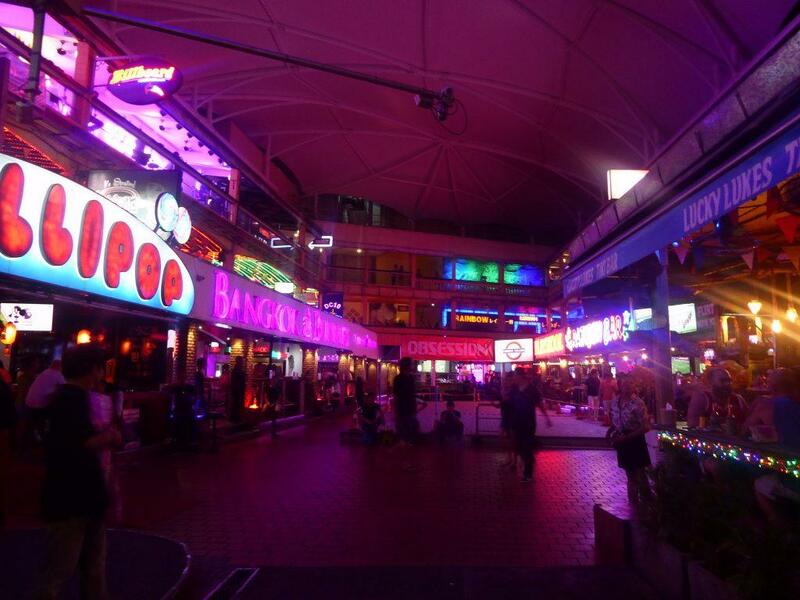 Patpong 1 has a popular night market running the length of its center with neon-lit go-go (pole-dancing) bars along the sides along with a couple of popular live music lounges. The Kings Corner bar has both female and transgender ladyboy dancers who dance in separate shifts. It can be challenging to work out which one is which. Patpong 2 has several popular go-go bars at the Silom road end including Badabing, Glamour, The Strip, and Black Pagoda. The Black Pagoda is in a sky bridge crossing the soi and is famous for its Japanese style vending machine selling the dancers used g-strings. There is also a fetish bar called BarBar which features a leather-clad doorwoman brandishing a whip. Drink prices in Patpong go-go’s are reasonable, ranging from 90-150 baht for a beer depending on the bar and time. One thing to watch out for is the Ping-Pong shows in upstairs bars which are often rip-off joints where you may end up with a large bill. Never enter an un-named bar and always double check prices before you enter. Location: Patpong 1 & 2, Silom Road. Getting There: BTS Sala Daeng (exit 1), MRT Si Lom (exit 2). 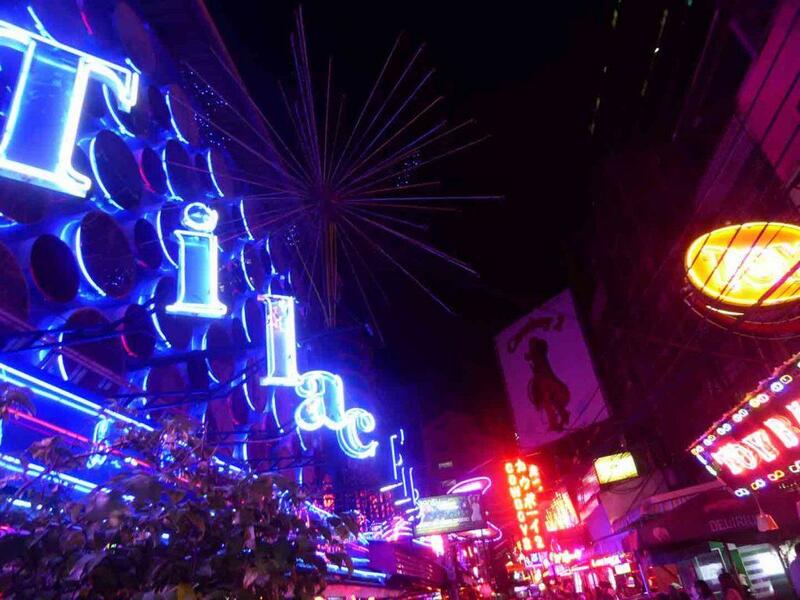 The Neon-lit strip of Soi Cowboy stands out a mile at night with its massive bar signs lighting up the street which contains about 20 go-go bars lining its sides. Soi Cowboy is always busy and the outside seating areas are a wonderful place to people watch and take in the easy-going atmosphere. The most popular and best go-go’s are Baccara, Tilac, Shark and the Dollhouse. Both Tilac and Cactus featured in the movie Hangover 2. Drink prices are reasonable and run at 90-160 baht at most bars. 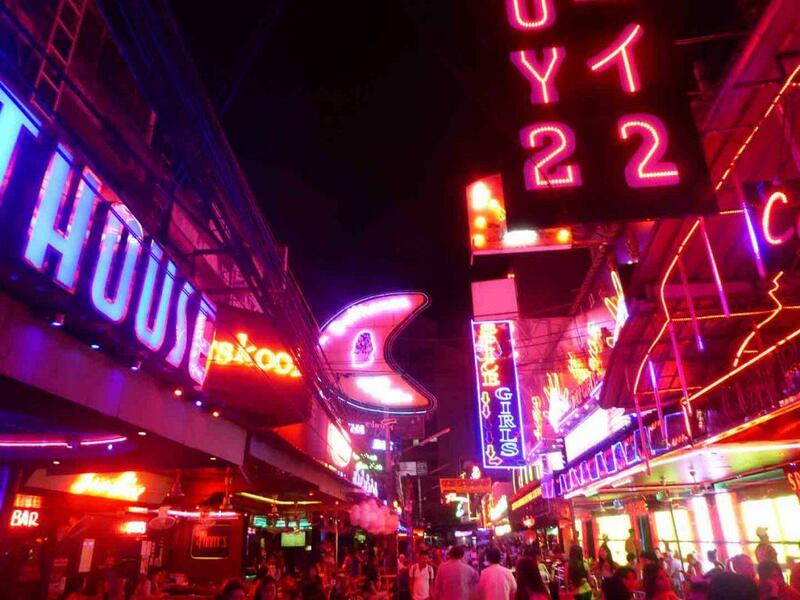 Some bars on the strip are more expensive such as Spice Girls, Deja Vu, Kiss, Sahara, Midnight and Rio with prices starting at 180-200 baht per beer. Adding to the color are the brightly uniformed hostesses stationed outside the bars trying to lure you in. There is one Ladyboy only bar called Cockatoo. Sams 2000 is an ordinary bar serving decent food while Country Road has live music and pool. Soi Cowboy runs between Sukhumvit 21(Asoke) and Sukhumvit 23 and is welcoming to both male and female visitors. The BTS and MRT stations are nearby. Location: Sukhumvit Soi 21 (Asoke). Getting There: BTS Asok (exit 3). You will need to cross the road at the lights. MRT Sukhumvit (exit 2). 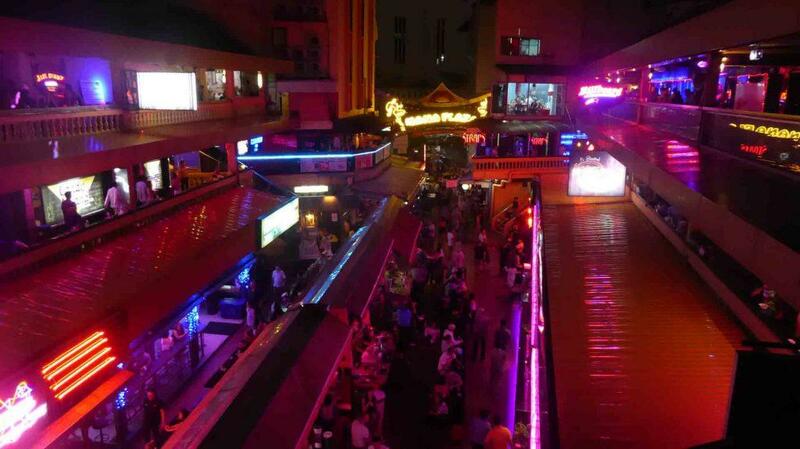 Located in Sukhumvit Soi 4 Nana Plaza is a 3-story entertainment mall featuring go-go bars and several beer bars. The plaza is U shaped around a central square on the ground floor which is where the beer bars are located. There are about 25 go-go bars. The biggest is Rainbow 4 which has over 100 dancers and is hugely popular with Japanese tourists. Another long-running popular bar is the hard rock-themed Angelwitch which puts on some elaborate shows. There are also six Ladyboy bars, Cassanova, Temptations, True Obsession, Straps, DC-10, and Charades. If you are male and walk past any ladyboy bars expect to be groped and if you enter inside expect to be mobbed, have your privates groped and have to fight off numerous attempts to snog you! If you are female expect to have your breasts closely examined. There is also a pool bar and tattoo shop on the ground floor. Big Dogs beer bar next to the entrance is a good people watching spot. Beer prices at Nana range from 120 baht to 180 baht. 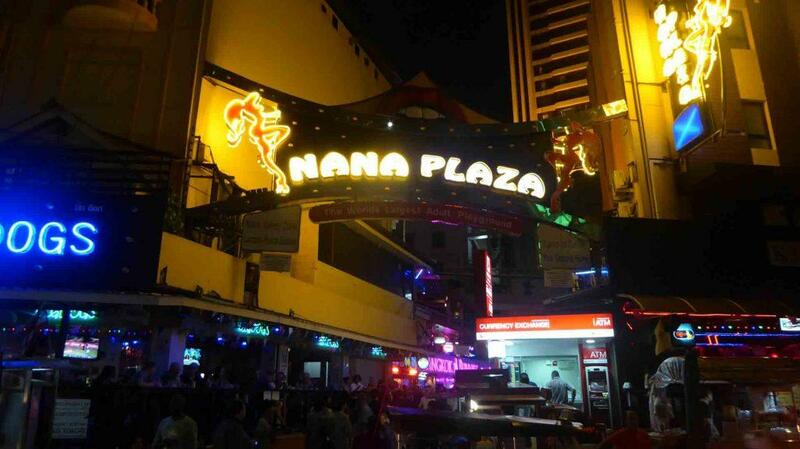 Nana Plaza is welcoming to both male and female visitors. Outside on Sukhumvit Soi 4, there are beer bars, an Irish pub, a branch of Hooters, pool bars, and live music bars. The plaza is a short walk from BTS Nana station. Location: Sukhumvit Road Soi 4. 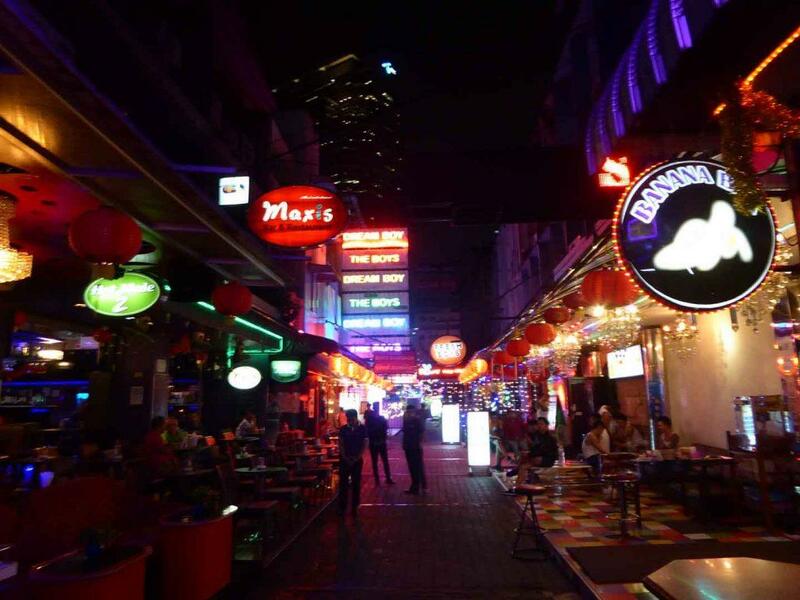 Although Bangkok is famous for its pole dancing ladies and ladyboys, there is also a gay equivalent known as Soi Twilight. It’s a strip of go-go’s and bars catering to a gay clientele but ladies are also welcome. Many of the bars have special shows such as exotic dancing, swimming shows, muscle men show, and ladyboy shows. Location: Soi Pratuchai, Surawong Road. (known as Soi Twilight). Getting There: BTS Sala Daeng (exit 1). Walk down Soi Thaniya, turn right at Surawong Road. Soi Twilight is on the left.